Ethiopian Foreign Minister Dr. Tedros Adhanomand and New Zealand Foreitgn Minister, Murray McCully. “This arrangement will enable New Zealand to assist in the development of commercial scale agriculture in Ethiopia, and build food security partnerships in the region,” says McCully. 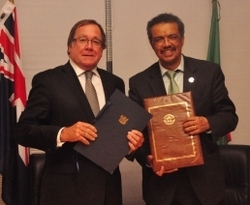 Foreign Affairs Minister Murray McCully and his Ethiopian counterpart, Dr Tedros Adhanom Ghebreyesus, have signed an arrangement to improve agricultural cooperation and food security. The Food Security Cooperation Arrangement was signed following a meeting of the African Union Executive Council in Addis Ababa yesterday. The arrangement will provide a government-to-government framework to encourage commercial partnerships between New Zealand and Ethiopian agricultural interests. “Africa is of increasing interest and importance to New Zealand, as evidenced last year when we made the decision to open a diplomatic post in Addis Ababa,” Mr McCully says. “Ethiopia has one of the largest populations in Africa, some 91 million people, a fast growing economy and is situated close to key markets in the Gulf..